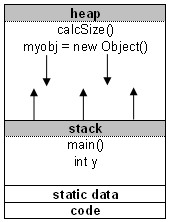 The text segment (often called code segment) is where the compiled code of the program itself resides. When you open some EXE file in Notepad, you can see that it includes a lot of "Gibberish" language, something that is not readable to human. It is the machine code, the computer representation of the program instructions. This includes all user defined as well as system functions. Now let's get to some details.